I went and made a throwing knife. I did it, I took the plunge and I'm not going back. I made a throwing knife. Anyhow. I want to make another with that other piece of steel, but I'd like some feedback first, shape, handle size, etc. What do y'all think? Great job! The best part is just that you're making stuff! Longer is better. A longer knife spins slower and is easier to control. In all the professional competitions the knife must be between 12" - 16". I find I like 13"-13.5 but it depends on the knife and the person. I have some 10.5" daggers I like throwing, I love my 12" Dismissals, and I have some 16" diamond points that are great to throw. Anything under 10" is going to rotate faster and it gets harder to throw. It can be done...I have some 3" throwers that can be thrown but it's harder to see what they are doing in flight to make your adjustments. Best thickness is 3/16. And thinner and is not enough weight, any thicker and it gets too heavy. General rule is about 1oz per inch. My throwers I use are 13.5" and with the handle they are 13.5oz in weight. Handle or no handle is up to you. If you do put a handle use something like G10 so it won't break, or leave about ½" away from the back end so if you hit handle first you're not hitting the handle, just the end of the blade. Throwing knives are not sharp, the edge is rounded dull. This is so you can throw from handle or blade and not worry about cutting yourself. Throwing knives are just for fun so no need to have a sharp edge. Keep the edge dull but keep the points nice and sharp. A good sharp point will help stick better. Always be careful, a dull blade with a sharp point can still do massive damage to you or others. 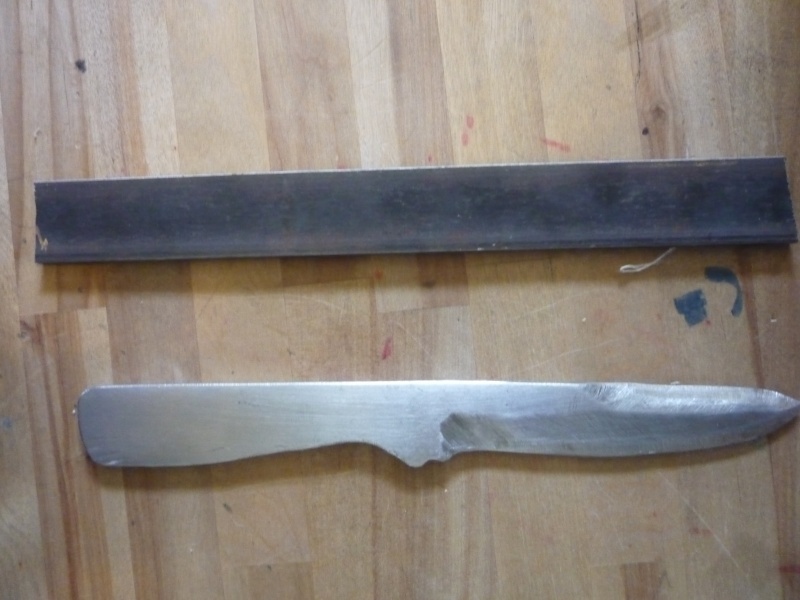 If you heat treat the steel or have it done it needs to be softer than normal cutting knives. Most knives are at a hardness of about 58rockwell, throwing knives need to be about 52rockwell hardness. This is so they won't break in half when being knocked around, a softer knife will bend slightly to absorb the shock of hitting things. If you're just learning or want some new tips check out some of the other post in the knifethrowing section. Also, I'm on a bunch of facebook knifethrowing groups and there are a ton of videos showing people doing different throws. I really suggest you check it out. I found that there is some simple steel blanks sold at my hardware store for only a few bucks. I can cut quite a few knives out of one strip and I have a forge, so I might try making my own throwing knives. Wow Sinza, thanks for the info! I'll look around for some 3/16" wide stock, but that piece I have is exactly like what I think CCK is talking about, I got it at the local hardware store and it's totally untreated/hardened to the best of my knowledge. I forgot to add the picture of the blade, but it's rounded off, I'm well aware of the dangers of sharp throwing knife blades (and have the palm scars to prove it!) and I didn't want to deal with that, so I just bevelled it and rounded it. It almost hurt to purposely destroy such a nice blade, but it is certainly the better idea. The throwing knife section of this forum is what made me want to make one! I've been throwing for a long time, but poorly and with no real progress. There's just a massive wealth of information there, and I'm loving it. 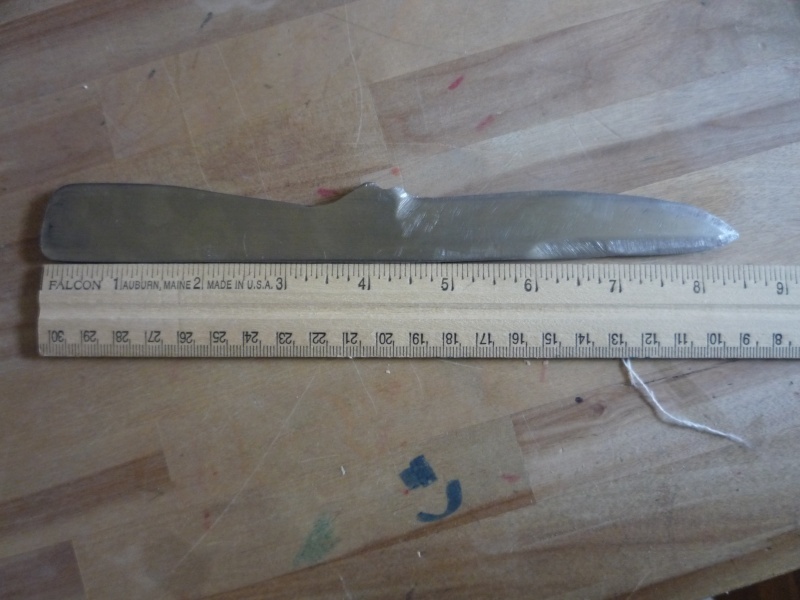 I learned a lot from this project, I know that I want the next one to be double sided, longer, lighter, and ideally wider, but I need to find a better source of steel to do any of that. Oh well, my birthday's coming up, I'll figure it out. Subject: Re: I went and made a throwing knife.